Peterborough United boss Darren Ferguson would love to keep on-loan striker Aaron Mclean at the club until the end of the season. Mclean scored his first goal for Posh since returning to London Road from Bradford City in last weekend’s pressure-relieving 2-1 League One win at Leyton Orient - a first in seven matches for Ferguson’s side. He is currently due to go back to Bradford City at the end of January. “I’d love Aaron to stay for longer,” Ferguson admitted. Mclean’s reported £5,000 per week wage would be an impediment to a permanent return to Posh. Mclean will start alongside Craig Mackail-Smith in Saturday’s (December 20) League One clash with Preston at the ABAX Stadium. Ferguson would love to field both playmakers Marcus Maddison and Erhun Oztumer, but the former is not certain to start because of an ankle injury. He missed last week’s win because of illness. Million-pound striker Tyrone Barnett is back at Posh after a loan spell at Oxford, but is unlikely to be involved against Preston. Midfielder Joe Newell is suspended. 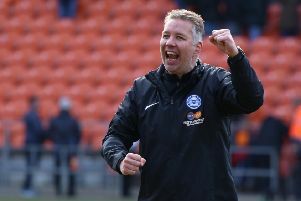 Ferguson admits Posh will have a tough time winning a second straight game as he believes his old club Preston already perform like a Championship side. Ferguson added: “Preston are physical, strong, well-organised and if they manage to get in front they make it hard for teams to get back at them. “They are missing Joe Garner, but they have Jermaine Beckford and Kevin Davies up front which is a strong pairing, although having said that Gaby Zakuani handled Davies very well when we won this fixture last season. “It’s a tough game for us, but we’ve had a good week. The win at Orient has done us the world of good, but it won’t count for much if we don’t now go on a good run. “I believe Marcus and Erhun could play together, but it might be a risk to play Marcus this weekend with so many games coming up. “If I stay with the midfield diamond I could play Jermaine Anderson, Grant McCann or Michael Bostwick instead of Joe so I have options.